You know what time it is. It’s about that time for the end-of-year wrap ups and Spotify has put out their own graphic concerning their platform. 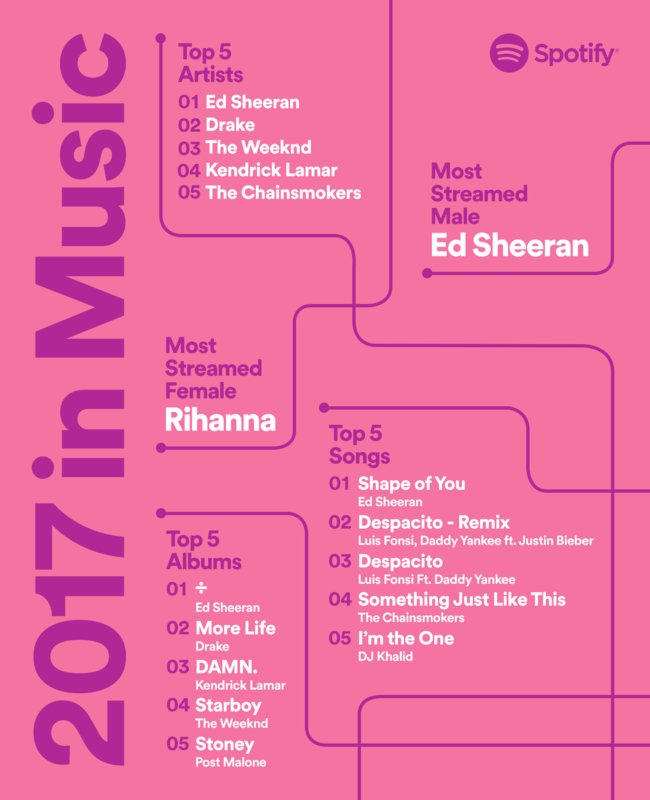 They have broken down numerous categories to show which albums, artists and songs dominated streaming this year and the results might not surprise you. Ed Sheeran was the undisputed winner in 2017, being the most streamed artist and having the most streamed album. Not to mention the most streamed song. But Drake was not far behind. Others who made the cut also include Rihanna, The Weekend, DJ Khaled, and Post Malone. You can take a look at some of the categories in the graphic above or more of a breakdown below, including “Most Streamed Groups” and “Emerging Genres”. 3. Kendrick Lamar — DAMN.